What is the Epic browser (and what makes it different)? Privacy is the top priority for the Chromium-based web browser. Once past the Big Four browsers — Chrome and Firefox, Edge and Safari — the battles for user share scraps are typically waged by specialties, with each contestant proclaiming why it's best at this or that forte. Vivaldi, for example, boasts that it's a throwback to times when browser austerity had yet to take hold; Brave dares to upend the online advertising ecosystem. 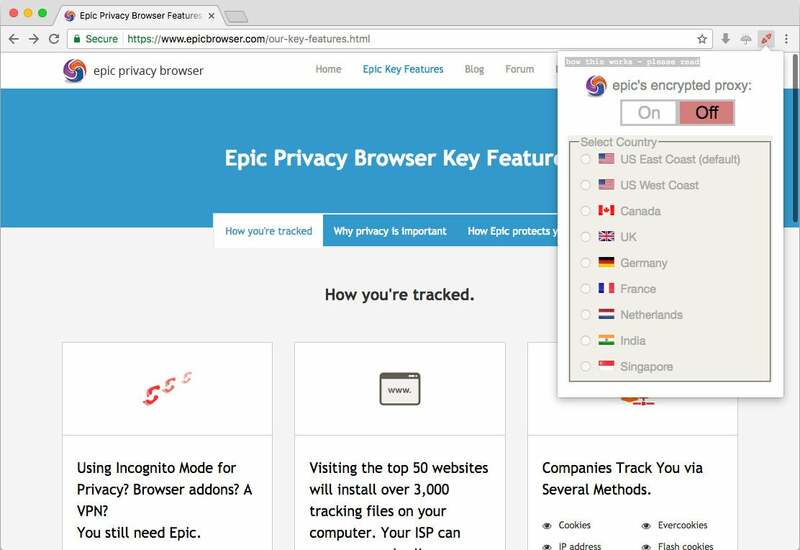 And some, like Epic, an almost-unknown browser that originated in India, have decided that pushing privacy is how they'll stand out, or try to. Computerworld took a long look at Epic — on Windows and macOS, the two supported operating systems — to figure out what it is, what it does and what it doesn't do. Here's what you need to know to better understand this browser with a difference. Is Epic as up to date as Chrome? Because Epic's developers need to have the final code of a Chromium version before they can begin to layer the Epic-specific components atop the open-source framework, they're usually behind Google. When Computerworld recently downloaded and installed the latest Epic for macOS, the browser's user agent asserted that it used Chromium 63. (The Windows edition said it was based on even-older Chromium 62.) Meanwhile, Chrome for the Mac reported that Chromium 67 was its foundation. Google used Chromium 63 to produce Chrome 63, which shifted to the production-quality Stable channel on Dec. 6, 2017; Epic is thus more than six months behind Chrome. Other Chromium browsers suffer from the same behind-the-times syndrome: Opera's current release, for instance, uses Chromium 65, which Chrome applied in the Stable version that debuted in March. "We believe that what you browse and search should be private. What you browse and search is no one's business but your own. It's as simple as that," says Hidden Reflex, the organization behind Epic, in the lead item of a FAQ on the browser's website. Every browser now claims to safeguard users' privacy. So how is Epic different? Epic takes several steps to increase privacy by decreasing the amount of information the browser spills to the outside world. For example, while rivals have manually enabled modes that automatically delete all traces of browsing history — called "Incognito Mode" in Chrome and "Private Browsing" in Firefox — Epic runs only in such a mode. When a user closes Epic, swaths of otherwise-retained data is automatically deleted, including all cookies, all browsing history and all contents of the browser's cache. Epic runs all search requests through a baked-in proxy service — actually an integrated VPN (virtual private network) — that Hidden Reflex itself operates. That means search engines can't sniff out the user's real IP address, and so can't track the user by that address. The proxy/VPN can also be turned on manually with a click on an icon beside the address bar to mask the IP address, preventing sites, services and online apps from recording the location, then using it to track you or add that to their accumulated information on you. Epic's VPN can be turned on manually to mask the IP address. Epic takes a slew of extreme-privacy steps to keep information from others. For instance, while some of the Big Four browsers block ads (Firefox has promised it will sport an ad-blocker before year's end, but it hasn't spelled out what that blocker will, well, block) or clamp down on tracking (as with Safari's tentative moves with Apple's Intelligent Tracking Protection, or ITP), none do both and none go as far. Epic blocks all ads as well as a host of ad trackers and tracking techniques that attempt to follow users through their online sojourns or identify them as narrowly as possible. The blocked trackers include sneaky scripts and other techniques used to "fingerprint" users. If Epic is based on Chrome, does it send data to Google? Hidden Reflex, the browser's maker, says no. "Epic by default removes all Google services from Chromium so that your browsing does not go through Google's servers," says the browser's FAQ. In practical terms, that means that services that lean on Google's servers — including auto-suggest in the address box and language translation — either are handled by Epic locally or are not available. What's the downside to Epic? There has to be one, right? Epic blocks almost all browser add-ons, for one thing. If you're wedded to a Chrome extension or two (or three, four or many more), that may be a big problem. "While they can be very useful, they represent a very large security and privacy risk, hence Epic only allows a few trusted add-ons," states the browser's FAQ. Among the few add-ons that do work with Epic are password managers like LastPass and RoboForm; Evernote Web Clipper, which clips content and stores that content in Evernote; and bookmark synchronization extensions Xmarks and Pocket. And some sites or web services won't work with Epic. To view television and movie content from Netflix, for example, users must install the IE Tab add-on. The browser also lacks a business plan, so while it's been around since 2013, there's no promise it will last. According to Hidden Reflex, the company is "working on it," meaning a way to sustain itself. Among the possibilities it cited: premium privacy services, sponsors on the new tab page (something Mozilla has tried), and private search sponsors. Where can I download Epic? The most convenient place to get Epic is from the home page of the browser's website, using the "Download Epic Now" button at the right. The page should automatically recognize either a Windows or macOS edition, then start the download process after a click on the button. If the download does not begin, select from the list near the top of the page: a Windows .zip archive, a Windows .exe executable, an OS X/macOS .zip or an OS X/macOS .dmg disk image.